The name Kargil is famous now. Mainly because it is associated with a War that was given its name as it was fought in this area almost 20 years back and it was the country’s first televised War. But few would imagine that once upon a time it was a major trading Route on the Silk Route which connected Northern and Peninsular India with Central Asia and China. Kargil is at a strategic location and is as such almost equidistant from Skardu, Leh , Padam in Zanskar and Srinagar. Infact its name itself is derived from its location. Kargil literally means a place to stop from all directions. Its etymology has evolved from the word Garkill. Where “Gar” means from all places and “Khil” to stop. And true to its name, all historical accounts of British and European travellers reveal Kargil to be just that. Situated along the river Suru (a tributary of the Indus, which flows into Gilgit Baltistan) it boasted of a fort built by the Ladakhi King in the 19th century. The old caravan bazaar ran along the river and a few mud houses by the slopes nestled in a green oasis of the Suru valley. Traders from all over the region and beyond converged upon Kargil. There were Punjabis, Kashmiris, Baltis, Yarkandis, Ladakhi, Tibetans, Afghans, Arghuns, Pathans, Kirghiz and all other ethnicities from the neighbouring Regions. The Dogra Rulers as well as the British promoted this Trade after the Dogras came into power and consolidated their Rule in the Region. They also improved and facilitated the creation of the Treaty Road which was a Trade Route all the way from Srinagar to Yarkand. At the time that the trade was flourishing there was a certain Gentleman by the name of Munshi Aziz Bhat of Kargil who was the official petition writer for the Maharaja of Jammu and Kashmir for the Baltistan Wazarat. A Petition writer in those days was a powerful man, as if you had an issue that you wanted to bring to the higher authorities and the highest being the Maharaja, who had to approach the Petition writer to do it on your behalf. So the strength of your case basically lay on how the Petition writer presented it. As such Munshi Aziz Bhat was a very well respected man in Kargil. The Kargil Sarai facing the Suru River. Munshi Aziz Bhat was a trader also being on the Central Asian trade Route and owned a number of shops in Kargil and his trading company was called Munshi Aziz Bhat and Sons. He set up a Serai, the Kargil Serai in 1920 to offer boarding lodging and storage places to the Traders. Soon the Serai became a stopover place for all kinds of traders from all kinds of places in Kargil. The Kargil Serai also served as a kind of an unofficial Post Office which received a lot of mail especially from the Hoshiarpuri Punjabi traders. The Serai had in its front a couple of shops as well which the Traders could use to display their wares. The Serai was a busy one in the late 1800s as well as the early 1900s and it saw many traders come and go. And then came the turmoil of 1947 when initially Kargil was occupied by invaders from the other side. And ofcourse with the Chinese occupation of Xinjiang and its move on Tibet the Trade Route was finally shut down by the Chinese in 1949. A once buzzing trade route and all its dependencies were suddenly shut. The Kargi Serai lost its guests as even the Hoshiarpuri merchants went away. The Serai fell into disrepair and meanwhile Munshi saab also passed away. The Seari was however bequeathed as family property to Aziz Saab’ descendents and so the three storied Serai remained for decades. A lonely relic in the Kargil bazaar of a time long gone. It remained under lock and key for a good 50 years but its condition kept on deteriorating. No one it seems was aware of what lay inside the Serai since decades. An establishment still run by descendants of the Punjabi traders from Hoshiarpur who were at the frontline of the Central Asian trade. In was a chance discovery in the beginning of this century that some workers were sent to the place to clear some mess as parts of the structure had collapsed. The workers unearthed some very interesting items and reported these to the owners. The Owners then decided to come and check for themselves and they unearthed in what can only be called a priceless treasure in form of various items related to the Central Asian trade and items from all over Central Asia, the Indian sub-continent, Tibet and even Europe. As luck would have it a visiting historian persuaded the family to preserve this price less collection instead of it ending up in some antique shops. And so was set up the Aziz Bhat Museum of Central Asian and Kargil Trade Artifacts to display the Collection of items unearthed. The range of artifacts unearthed from the Munshi Aziz Bhat Sarai has given invaluable insights into not only the forgotten trade history but also into the corss-cultural, cosmopolitan past of Kargil. These artifacts aren’t mere antiques but they are a testimony to the fact that Kargil was a melting pot of cultures, languages, lifestyles and ideas. They are now on display in a part of the Munshi family’s house that has now been converted into the Musuem. The diverse collection of artifacts include not only the goods that were traded along the route but also the items used by the traders and people involved in the trade. Some of the choicest artifacts include hookah pipes from Yarkand, rugs from Kashgar, fabrics — dyed and raw silk from Khotan in China, natural dyes, costumes, jewellery, coins, shoes, utensils and ammunition. Apart from these, the museum incorporates mercantile items from the late 19th and early 18th centuries like leather skins, coarse cotton cloth, carpets from Central Asia, British horse seats and saddles, buttons from Italy and items from the factory of the Nizam of Hyderabad. Over the years, the museum has also acquired various local artifacts that are relevant to Kargil, some of the key artifacts have been the first hand written Quran by the Buddhist Ruler King Namgyal of Kartse sometime in the 14th/15h century and a number of legal manuscripts that are written both in Tibetan and Urdu for the benefit of the King as well as his people. This was at the time when Islam was spreading across Ladakh and most of the rulers were Buddhists. This Museum is a must go recommended place to go to in Kargil in case you are interested in the history of the Central Asian Trade along with the Central Asian Museum. 1. Toiletries / Soap, Lux soap, Tooth Brush, / Shaving Brush, Pear soap, and Shaving Soap. / Place: - England, Germany, Italy, USA./ Period : 1903, 1905,1926, 1939. All these finished & believed to be luxury, were imported From England, Germany & USA. 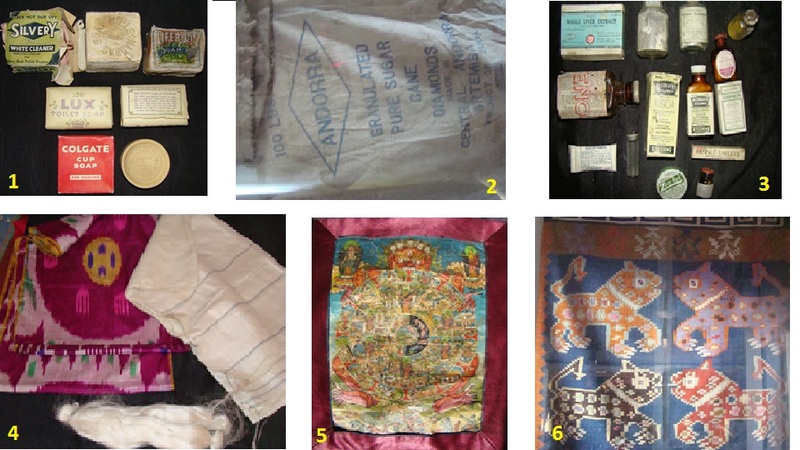 After reaching the Mumbai Coast, these luxury items travels all the way from Mumbai To Central Asia, Via Yarkand, Khotan, & Kashgar. The merchants with caravans of these goods either batter or sold these items to nobles. 2. Local Name :- Jola / Place : Cuba / Period : 18th Cent 100 LBS, Sugar sack from Cuba imported to Central Asia. 3. Modern medicines / Place : Britain ,USA / Period:- 18th Century / Introduced by the different Moravian Missionaries these medicines were unknown to Central Asia & Tibet. 4. Raw silk thread, Plain Silk & Imperial silk / Local Name : Shahi. / Place : Khotan/ Preiod : 17th Century Known as Shahi, or the Imperial cloth, introduced to the world from Khotan. A rare Thanka Painting, gifted to Munshi Aziz Bhat, by the villager of Rangdum. Showing the wheel of life. 6. A Rug from Bukhara / Local Name : Namdah (Fingma). / Place : Bhokara. / Period : 1822. A Central Asian Rug from Bhokara, Name of Mohan Lal (from Kashmir) who happens to be the Assistance of Sir. Alexender Burnes, a British officer of the company is written in the Center.